Hello everybody! 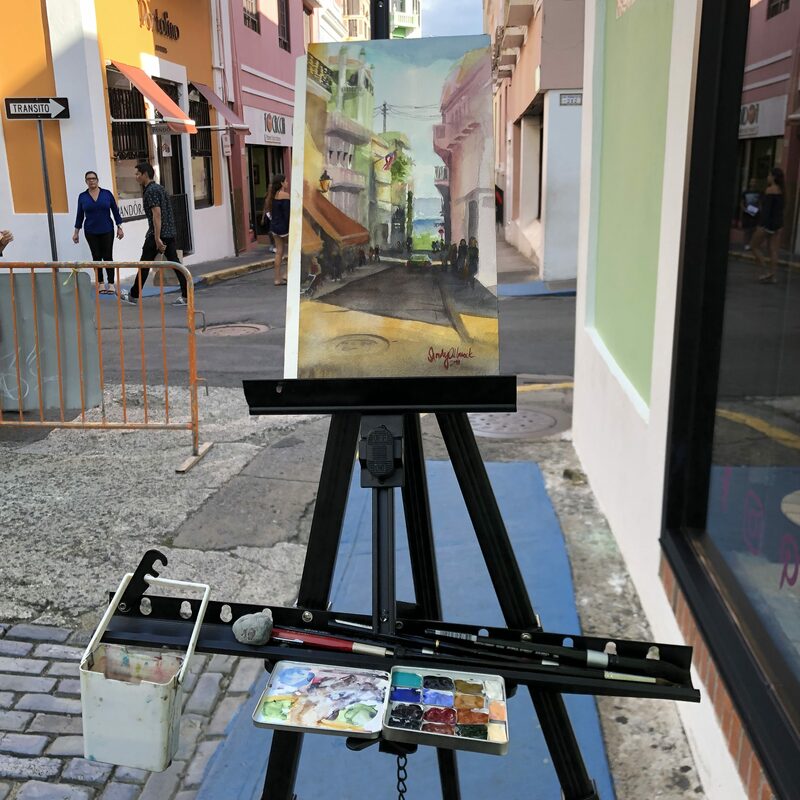 I’m having a heck of a great time here in Puerto Rico, and thought I would share a few photos of my paintings for those who haven’t been following on Instagram. Thanks so much for visiting - see you again soon! Oh, Sandy! These paintings are stunningly beautiful! I’ve never been to Puerto Rico, but this makes me want to go! I hope your vacation/trip is as lovely as your paintings. Truly awesome work Sandy!!!! Can’t wait to hear which of your ‘mini paint sets’ you liked best and why…so intriguing! Enjoy the sunshine, views, and your FUN times while there – know you will share your heart with those you meet! HI Sandy. Thanks for sharing. If you are planning to sell your paintings please let me know. Great photo’s and your watercolouring are awesome. Whishing you a lot of fun and a great time! Beautiful work enjoy my beautiful island. I’m from Puerto Rico but live in Arizona. Enjoy and absorb every details of our culture. Gorgeous paintings! And I love seeing those tiny palettes in action!! Wow Sandie you are one talented lady. I’m not following you on Instagram so I guess I had better start. Not at all surprised with how beautiful your paintings are. They are so lovely. I have visited Puerto Rico and it is nice. Enjoy! Just curious, but is there electricity/services where you are staying? Wifi is fairly reliable in San Juan even though it’s pretty slow. Driving to other towns though, I have to keep an eye out where I am because I usually rely on my phone to tell me where to go. When it stops in the middle of a mountain or out on a tiny road or in a winding neighborhood… Then I just have to keep going till I come out the other side! LOL i’m also getting used to the idea that nobody pays attention to the lights because they don’t really work right and a lot of these places. So I get beeped at a lot for waiting and letting people through . My daughter has organized a trip with a group of students from her school to help Puerto Rico this summer and has been really enjoying all your posts on social media. LOVE all your gorgeous artwork you’ve been sharing. Looks like you’re having a blast. Where are they planning on going? If I can get to it, I can take pictures of the place for them. How lovely! What a great spot to be. 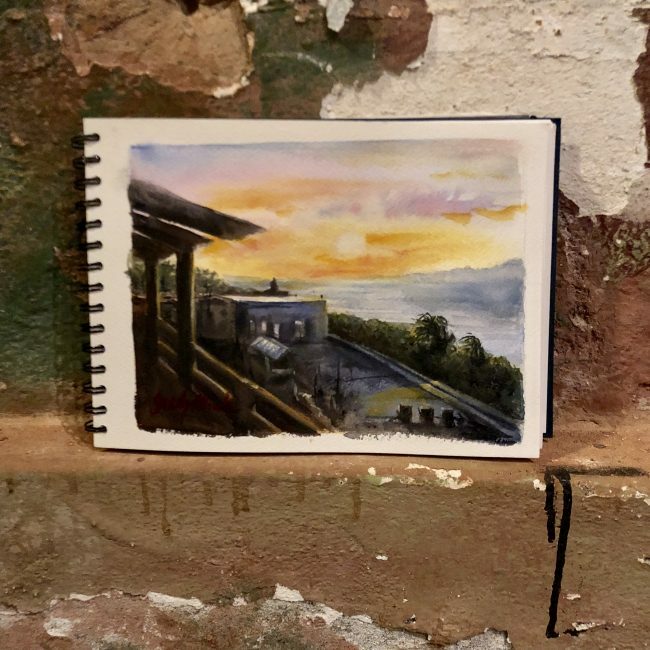 I so enjoy being able to see a bit of Puerto Rico through your marvelous watercolors, Sandy!! Beautiful & magical, they are! Meant to add…… thanks for sharing your trip via Instagram. I’m following your posts there too! 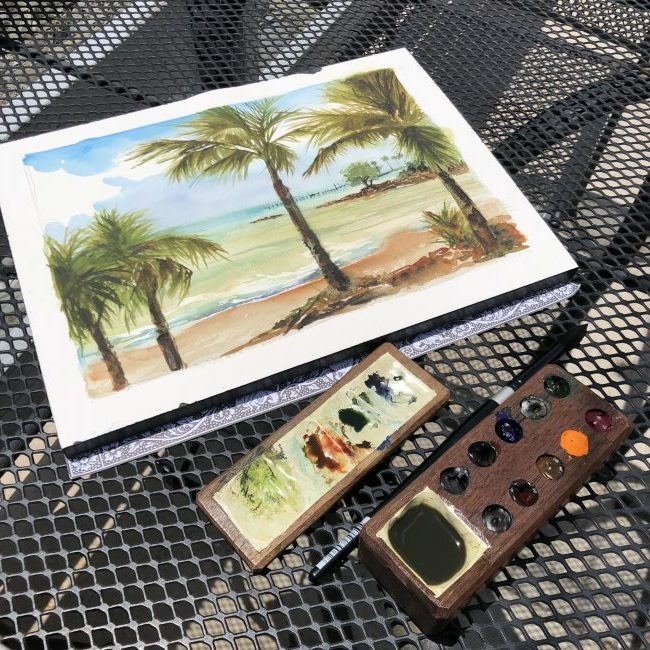 As the amazing artist that you defiantly are Sandy, you will know the name and number of the Daniel Smith watercolour green that I am right now seeing your beautiful, stunning paintings and Puerto Rico ! I’m so happy your are having a good time in PR. It looks as if you are getting lots of painting done as well. Your pictures are beautiful and capture the feel of where you are. You never cease to amaze me. Keep up the good work but don’t forget to enjoy your time there. Wow, amazing! Enjoy your vacation! Your painting are just amazing! And it gives me hope! As I’ve mentioned before I just started a watercolor class. As an oil and acrylic painter for many years, I’m having trouble handling the watercolors – they all seem to look like acrylic paintings (not luminescent like my teacher keeps saying). But I see some of yours are more “solid” like mine seem to be. So I guess I can’t be too far off! Now if I can just learn to draw like you! Have a wonderful trip and TFS! Oh Sandy, these are all amazing! Well done as always and keep having fun! Wow Sandy so brautiful I feel like I’m right there . You are so talented ! Thanks for sharing your trip with us all. Absolutely stunning water color artwork, Sandy! Glad you are having fun in Puerto Rico and thanks for sharing with us. Just beautiful Sandy! You’re sooo talented! Yes, I’ve been following on Instagram. I especially love the beach and ocean scenes, since I live in the Heartland and don’t get to either coast very often… Thank you for the chance to see what you’re seeing!